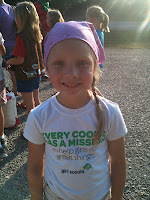 This is the wunderkind's first year in Girl Scouts. She's a Daisy, to be precise. I wasn't a Girl Scout, but got extensive cookie sales experience when my sister had a stint as a Brownie. She was all jacked up to sell the most cookies so she'd be able to go to camp for free. Turns out, sales really isn't her bag. So, I walked her around the neighborhood and sold cookies, then turned the order form loose on mom's company and dad's too. She won. She went to camp for free. She had a scavenger hunt for her breakfast. She hated it. She never returned. Well, times have changed, as they say. Back then, Daisies didn't exist. Back then, the Girl Scouts had their own camp. (I'm told someone made the wise decision to sell the camp, leaving the Girl Scouts of the Midlands sans camp.) Back then, you had to search in the woods for breakfast...find some milk, then find someone who had found cereal. I mean, really? Is it even legal to make kids scrounge around in the wild for their food? How long can milk hide in the forest before it becomes deadly? 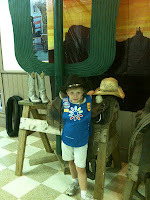 Anyway....a large troop hosts an "encampment" at the Boy Scout's "Camp Barstow" to which they invite other GS troops. Our troop attended last year and found it was worth returning to this year. So, this was the first mother-daughter camp-out for me and the Vivver. The short version of the story is this: we had a great time! Viv is super pumped about the fact that she got to sleep in a top bunk, didn't fall out and stayed in her bed all night long, both nights. We played games, made crafts, hiked around, saw a police horse, had a storyteller, made s'mores. I'd been to camp when I was growing up, so I knew what camp is like. What I was curious about though, was the burning question, "what is the food going to be like?" Well, happily, it exceeded my expectations. I'd heard that Camp Barstow is "rustic." So, I was really expecting something along the line of pre-made ham sandwiches on white bread. I was wrong, and I'm glad I was. The host troop cooked and served the meals. For breakfast on Saturday, pancakes, sausage, biscuits & gravy, cereal and scrambled eggs were available. When lunch rolled around, we had fried chicken breast (REAL chicken, no nasty chicko-patty thing) sandwiches, baked fries, fresh apples and bananas and a salad bar (hot damn!!). When dinnertime rolled around, we found the salad bar was set up again, and had country fried steak, mashed potatoes & gravy, green beans and enormous brownies. This morning, as everyone was bugging out, they were offering cereal, bananas, apples and cinnamon swirl muffins. Added bonus? I DID NOT have to constantly harass Viv about eating her meals. She just ate without any prodding nor negotiating for dessert! To the Girl Scouts out of Elgin who hosted the "Wild West Encampment" I say, well done ladies. The entire event was well organized, the activities were interesting to the kids, the food was a pleasant surprise (well prepared, good choices, nice flavor), the setting was awesome and the theme was incorporated throughout the weekend. The wunderkind and I will definitely attend this event again!